So my cousin George (‘sup yo!) came up with THE. MOST. BRILLIANT. name for my next sweet treat. I know caps are obnoxious, but the Kanye just passed through me, so forgive. Allow me to explain the awesomeness of this name. My dad, Sebastian, is known for a few things, including: 1. The mustache he’s had probably since birth that he refuses to shave “until one of you girls gets married” (so yeah, he’ll be mustachioed for while) 2. The catch phrase “Ok, time to go!” 3. His sweet dance moves (No joke. He wins the dance-off. Every time.) and 4. His pet name, Joy. Many of the men, and some of the women, in my Indian-Catholic family have “good names” and “pet names.” My mom affectionately (I guess?) refers to Dad as Joycha. 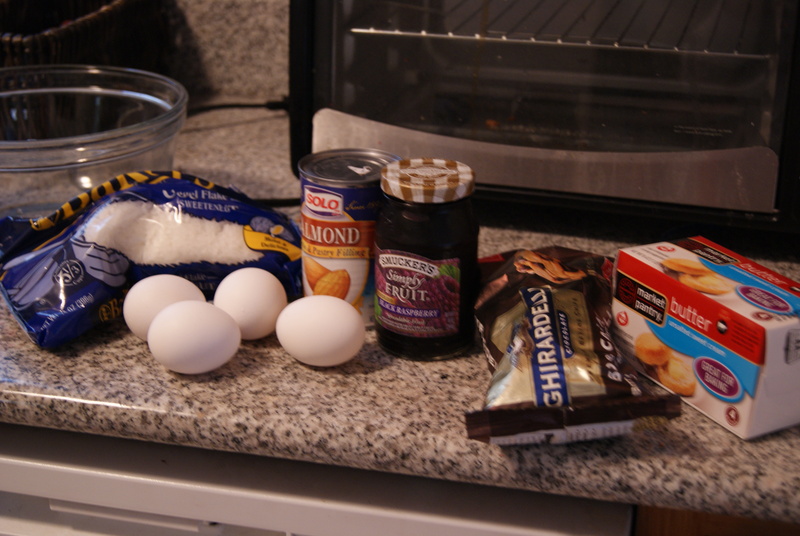 And so, George challenged me to come up with a dessert known as the Almond Joycha by Easter Sunday. As he stated, “it could be a play on the classic Almond Joy with coconut, almonds, and chocolate or something entirely different. As long as it fits the name.” Now, in my mind, “fits the name” means the treat has to include two things: almonds and Joycha. What better way to honor the dance machine who made me than with a sugar and almond-filled concoction? I decided to veer away from actual Almond Joys in order to fancy up the dessert a bit. Actually, let’s be honest: I’ve been craving rainbow cookies for, like, years and am too lazy to roll into my local bakery to buy a pound (also, they’re kind of expensive). Rainbow cookies–which I will be baking in a couple of weeks, so keep an eye out– are typically made with either almond paste or almond filling, and have a cake-like texture with a sweet, subtly nutty taste. I tweaked the recipe to my liking. *Now, you could use almond paste for this recipe but a. it’s significantly more expensive and b. the texture makes it more difficult to work with and blend into your other ingredients. When your egg yolk/almond mixture is fluffy, stir in your flour to form a dough. Now, move on to the egg whites. 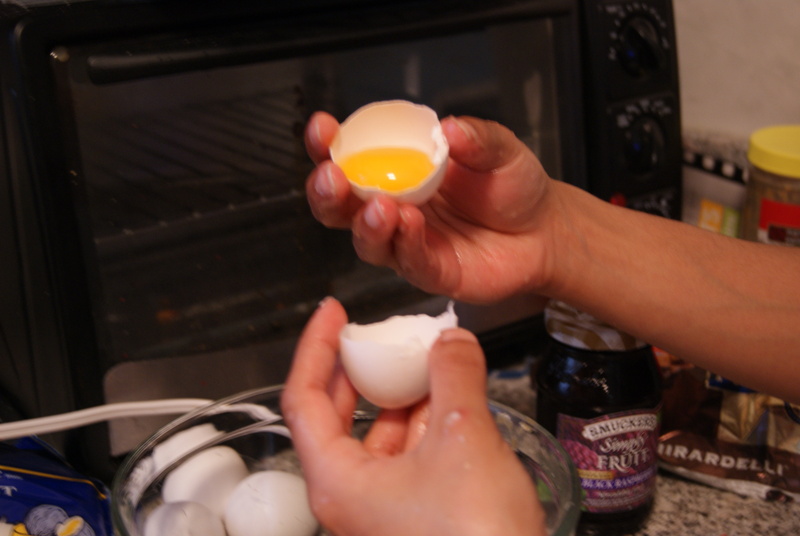 Using a hand mixer or stand mixer at medium speed, beat the egg whites until soft peaks begin to form. This should take about five minutes. It took me ten, but only because I don’t know how to properly attach the beaters and they flew off mid-mix. I spent two minutes saying words not meant to be uttered on Easter Sunday, and spent another three scrubbing those suckers clean. When puffy and peak-filled, fold the egg white mixture into your dough, and spread the mixture into your pan. Bake for about 25 minutes, until a toothpick inserted into the center comes out clean. 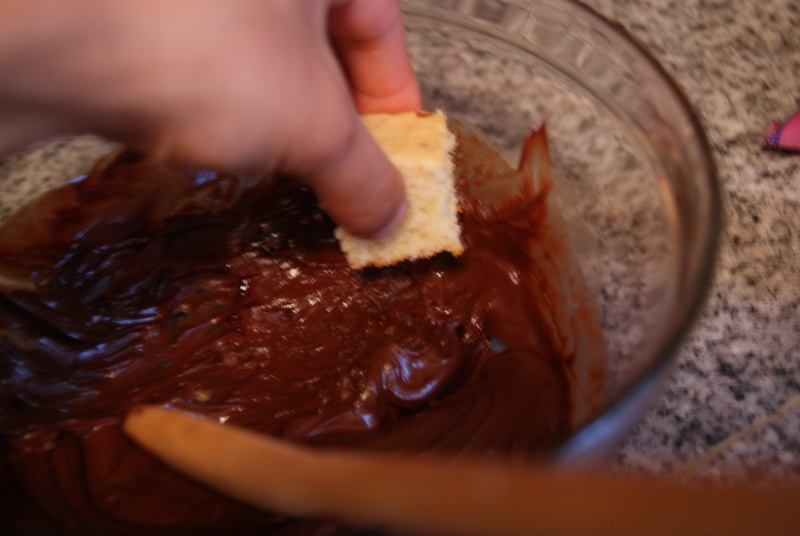 While that’s baking, combine your chocolate chips with a tablespoon of butter in a microwave-safe bowl. Heat the chips in 15-second intervals, stirring after each nuke, until the mixture is melted and smooth. 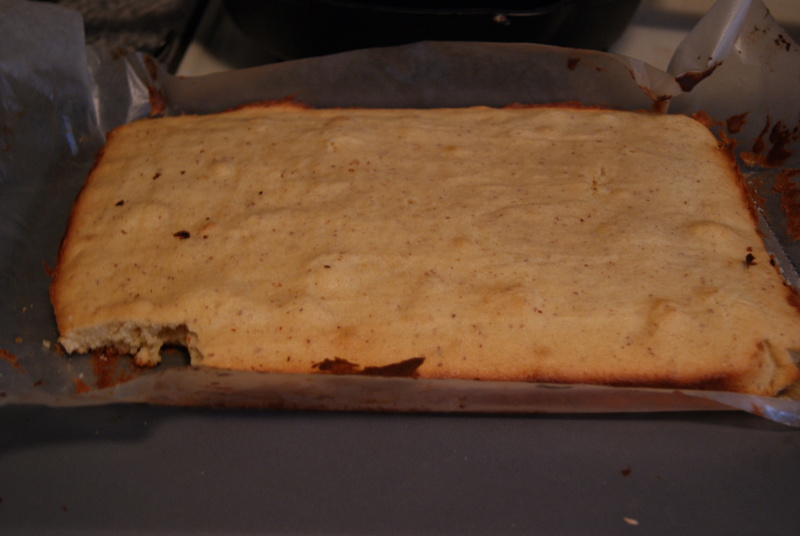 As soon as my cakey cookie was done, I stuck the pan directly into the freezer for about 15 minutes. If you’re more patient– like, eons more patient– you can let it cool on a wire rack. Either way, when it’s cool to the touch, pick up the cake by the parchment paper flaps (See how handy those are?) and place it onto a cookie sheet or smooth surface. Cut out squares or rectangles (or both if you’re creative/geometrically challenged like I am). Here’s where things get…complicated. I am positive that there is a neater way to accomplish this, but, well, I yam who I yam. I dunked one side of each cookie into my melted chocolate and placed it on a cookie sheet to cool. 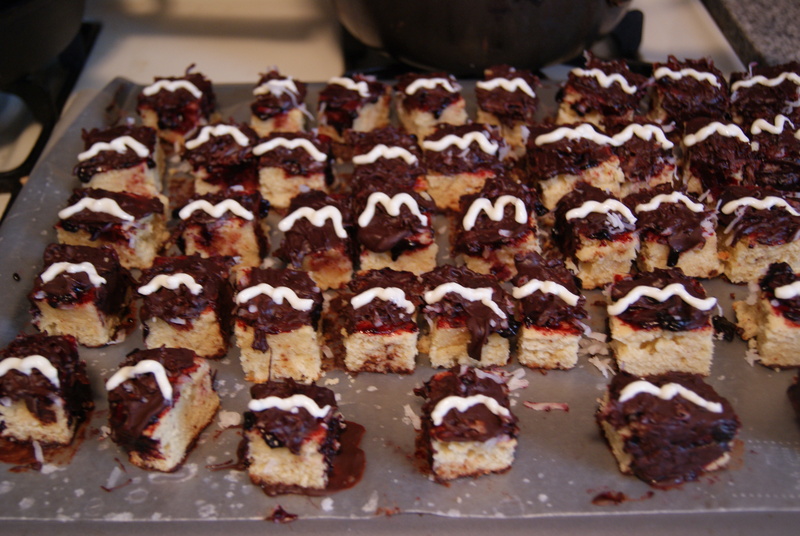 Then, I spread jam on the tops and sprinkled coconut over the sheet until each cookie was covered. Lastly, using a butter knife, I spread the rest of the melted chocolate over the top of each cookie, then placed them in the refrigerator to allow the chocolate to harden. Mess? Yes. Mess. Also, delicious. I would recommend NOT doing what I did here. Use a knife to spread the chocolate on. Half-finished product, before they were re-cut to near-perfection. Those are mustaches. So you know. Now, I am sure you are all wondering: what did Joycha think? And why isn’t his proud mug to be found anywhere in this post? Well, sadly, Joycha is perhaps the only member of the family who is not a fan of my venture into blogging. I can’t say I am not disappointed, but I can say that he is OLD. My guess is that he knows not what a “blog” is. Someone hand the man a dictionary and a cupcake, because he is a grouch. Fortunately, the rest of the clan–including George– seemed to love them. Ok, time to go! They were awesome! Definitely fitting of the proud name of Joycha. Laura loved them too. I enjoyed everything at Easter, including the bunny cake and Rhea’s truffles & pineapple pie! Thanks, cuz! Happy to hear it 🙂 And Rhea’s desserts were ridiculously good. I took a slice of pie and some truffles to go, and I am so glad I did.